The food production and packaging sector requires, due to the sensitivity of the environment and level of regulation, specific materials and solutions. Mitsubishi Chemical Advanced Materialss product portfolio includes a range of materials specifically developed for food contact. Our solutions aim at reducing maintenance costs and increase productivity in packaging equipment, also for non-food goods or pharmaceuticals. The creation and introduction of the new "Food Grade" material family is based on Mitsubishi Chemical Advanced Materials’s migration limit tests and offers customers not only time savings on their application specific testing, but also the advantage of traceability along the entire value chain and control of the production process following Good Manufacturing Practice (GMP). It also ensures maximum hygiene and non-contamination of food stuff that comes into contact with Mitsubishi Chemical Advanced Materials’s materials. Mitsubishi Chemical Advanced Materials supplies stock shape materials as well as finished parts solutions for global clients in the food processing & packaging market. Our local technical service team is ready to help you providing details on materials, such as chemical resistance data, and identifying the right material for your application. Naturally, food compliancy certificates will be issued for the chosen products. TIVAR® 1000 TIVAR® Oil Filled TIVAR® CleanStat TIVAR® H.O.T. Challenge: A piston is used to pump a milk-based liquid into the bottles. It is sliding along the cylinder walls and also has the function of sealing during the dosing process. Solution: Ertalytewas chosen for this application because it offers an excellent dimensional stability combined with good wear resistance. Benefits: When using Ertalyte there is no additional need for external lubrication. Ertalytehas a food compliant composition according to EU directive 2002/72/EC and complies with the requirements of the '3-A Sanitary Standards for Multiple-Use Plastic Materials'. This is shortening the compliancy certification process, saving costs and increasing productivity. Challenge: The chain guider should assure a smooth sliding of the chain and therefore needs to offer excellent wear resistance towards the chain. To assure a better cleaning, the temperature during cleaning has been increased. The material solution should meet all these requirements. Solution: A housing of TIVAR H.O.T. was selected for its excellent wear resistance combined with a superior temperature resistance compared to regular PE-UHMW. Benefits: Excellent resistance against cleaning chemicals and compliant with the requirements of the '3A Sanitary Standards for Multiple-Use Plastic Materials', resulting in time savings during the food compliancy certification process of the equipment. Challenge: The manufacturer needed a distribution spool for cookie filling. The spool also pushed the cookies out, working like a piston. The material needed to maintain good stiffness at elevated temperatures and at the same time be of low weight. Low heat conductivity and easy maintenance were other requirements. Solution: Duratron PEI 1000 exhibiting stiffness and dimensional stability at operating temperatures up to 160 °C. Benefits: Replaced a metal assembly that needed more time to disassemble and clean, at the same time offering lower overall costs and food contact compliance. Challenge: A small bread baking machines manufacturer needed a low weight part to press the dough out of a dosing chamber. It needed to show very good wear resistance, excellent frictional properties, very good release properties (no sticking of dough), dimensional stability, chemical resistance and high load capacity. Solution: Ertalyte TX with better wear resistance, sliding properties and dimensional stability than Polyoxymethylene (POM) or Polyamide 6. Benefits: Maintenance and design cost reductions, no corrosion problems like aluminum, food contact compliance, better hygiene and safety performance along with considerable weight reduction. Challenge: Inside the forming equipment minced meat is pressed into a moulding plate, shaping the hamburgers. Then the plate slides out horizontally, letting the burgers fall onto a wire belt. The plate needed to be wear resistant and dimensionally stable, holding its flatness throughout the pressing cycle. It needed to be easy sliding without the application of external lubricants. Solution: Ertalyte TX was chosen as the best solution thanks to its dimensional stability and excellent wear and frictional properties. Benefits: Chemical resistance against cleaners, good and easy machining, and food contact compliancy are part of the package which helps to reduce overall costs and provides a better hygiene of the equipment. Challenge: To remove the full digestion channel of a slaughtered chicken, a rotating drill and grabber is inserted into the bird. The housing is machined in plastic of low weight and good wear resistance. The part needed to show excellent release properties (no meat adhering to it), very good impact resistance and good cleanability.Solution: TIVAR 1000 was selected because it met all the requirements.Benefits: Excellent resistance against cleaning chemicals and food contact compliant composition. This cost effective solution helps increase flexibility in handling during the slaughtering process and maintenance. 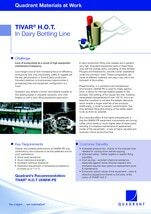 Challenge: Bottling and canning lines require sliding elements with good sliding and wear properties. The material has to be non-sensitive to impact and must withstand chemical cleaners. Solution: Conveyor stars made of TIVAR1000 meet all criteria for applications in filling lines. TIVAR1000 offers excellent sliding properties and high wear resistance. Its impact strength protects bottles/cans and conveyor lines. A very good chemical resistance extends its lifetime and reduces downtimes. Benefits: Filling, transportation and packaging lines profit from the excellent sliding and wear properties of TIVAR1000. Line operators appreciate its good working temperature range and noise absorption. Challenge: A packager needed a mould to form the paper box in its equipment for liquids. The mould needed high mechanical strength to resist the compression forces and dimensional stability under load and temperature. Wear resistance, low weight and chemical resistance during CIP cleaning were also required. Solution: Techtron HPV PPS was chosen due to its better wear resistance over PEEK or aluminum. The plastic has excellent dimensional stability under load, with no moisture pickup and a low CLTE. Benefits: Costs were reduced due to lower maintenance requirements. There are no corrosion problems as with aluminum moulds, even when harsh chemical cleaners and sterilization processes are applied. Low weight and in-use noise level, food contact compliance, excellent hygiene, safety in use and ergonomical handling during maintenance are all part of the package. Mitsubishi Chemical Advanced Materials offers the broades range of EU 10/2011 compliant stock shapes for the food industry. For more information on the regulation, and our new and fully tested product family, please click here! Want to find out more about our Injection Molding solutions ?